The line that separates success and failure with a mechanical fastening system can often be a matter of knowing where to turn with the right questions. The Internet, proactive manufacturers and improved distribution make it a lot easier to get advice and involvement from experienced professionals today than it was in the past. The technology of fastening also has improved, with many more user-friendly systems now available to field personnel. All in all, the prospects for job success, and labor-saving, continue to improve. But still questions exist with many users, designers, specifiers and owners. With an eye toward answers, we visit the 10 most common complaints in insulation fastening. 1. "The insulation fell down after it was installed. What we use seems unreliable." Whether the fastening method is adhesive applied anchors, self-sticking/peel-and-press pins, weld pins or any of the multitudes of other systems now in use, knowledge before the fact usually answers questions after-the-fact. The best prescription for success begins with knowing (and following) the manufacturer’s recommendations, understanding (and using) guidelines for application, and yes, even reading the instructions. Proper training by manufacturer’s representatives and qualified distributors can be crucial, too. Adequate instruction can prevent problems before they occur, and can take the guesswork out of a specific application while on the job. Reviews of manufacturers’ records and distributor support files show that the vast majority of mechanical failures occur when one component, or a combination of system parts, fails to be used properly, or to be used under proper conditions. While there’s no "magic bullet," taking care of basics seems to work just as well in insulation fastening as it does on the rest of the job. 2. "We’ve had problems with these type of systems and we’re not comfortable trying them again." There is absolutely no reason to experience repeated trial-and-error if the problems and idiosyncrasies of past technology don’t change. Why risk a job with costly experimentation or with a process that is detrimental to your work? That having been said, technological changes are affecting all of our lives at an ever-increasing pace, and a great deal of that change is viewed as positive. Labor-saving devices in the mechanical end of insulation fastening are an excellent case in point. A new generation of worker is coming to "the site" with a skill set that includes labor-saving ways to make applications run more efficiently, and at a reduced overall cost. Many workers are aware of the abundant innovations available to the insulator today. Their comfort level is much higher than those semi-exposed to technology in years past. Adding to worker’s levels of comfort has prompted support by manufacturers, distributors and representatives as problems arise (not weeks, or months, afterwards), and all aid in ease of use. 3. "My people don’t understand it. It’s just too hard to use." This complaint is especially associated with the specialized welding process used in insulation fastening. A better understanding of the process itself tends to eliminate a majority of the difficulties. 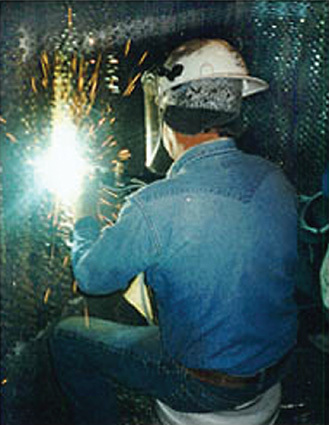 Most pin welding is achieved using capacitor discharge (CD) equipment and fasteners designed for the procedure. A great deal of the guesswork has been eliminated from pin welding in the last few years through new solid state CD components and improved fastener designs and materials. In other words, successful fastening can now be a function of technology more than labor. 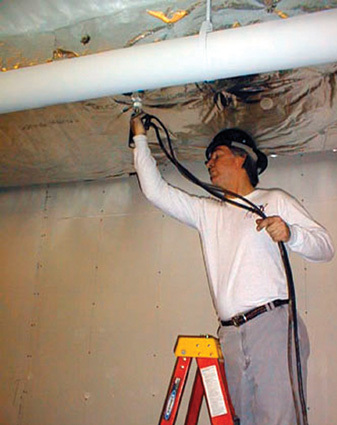 Through proper training (or retraining), insulation fastening crews can be taught the right techniques, as well as the care and operation of the latest equipment to become more productive on the job. The language barrier, once a notable hindrance to proper use and understanding of more technical equipment, has begun to pass out of existence as manufacturers create operation literature and support materials that offer multi-lingual instructions and easy-to-follow graphics. 4. "It’s too time consuming. Other methods seem faster!" The adage "it doesn’t take any longer to do it right" most certainly applies in today’s construction world in fastening systems. Granted, it can take time to get the proper training and to assemble the correct equipment and accessories in preparation. However, the end results–the expected results–make the investment in time worthwhile. The days of heavy, cumbersome equipment, requiring all sorts of special considerations or attachments, are long gone. Highly portable systems are now the norm, and they are easy to set up and easy to operate. These portable units can communicate with the operator, too, so he has a much better understanding of whether conditions are favorable. Of course, special circumstances require special system setups, and under those conditions there is only one way to do it–the right way! 5. "Equipment and support are difficult to get here." This complaint may certainly have been valid not all that long ago. In recent years, however, changes in supply and distribution have made the range of insulation fastening choices readily available in all major markets throughout this country. 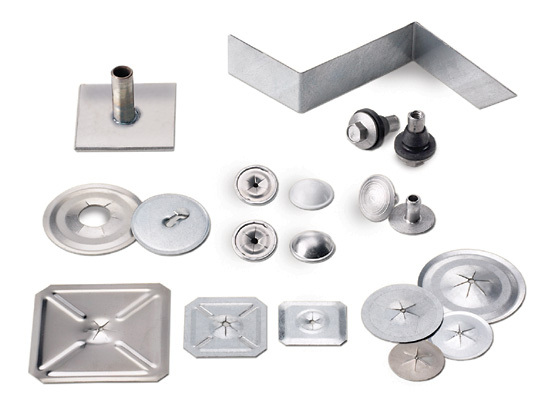 Distributors and their branch locations are expanding into a broader range of fastener system offerings, including not only the fasteners and related accessories, but also installation equipment and job-site assistance. With the newer, more portable welding systems, full-line distributors and their outlets are now stocking repair and replacement parts, as well as consumables. In some cases, distributors are making new equipment and rental units available directly from their branch locations. That means desired insulation fastening systems are much more accessible to those who ultimately need them and where they need them. 6. "Pin welding just doesn’t seem safe." It’s true that welding equipment and necessary power introduces a new set of safety precautions on the job site. Operator safety, however, is easily managed, just like other potentially harmful situations in today’s construction environment. First of all, design of equipment is the safest it has ever been. Redundancies built into system functions assure the safety of everyone on site. Hands-on safety training is available to reinforce proper practices and introduce the up-to-date features found on newer equipment. Printed materials, especially those incorporating how-to and step-by-step graphics, reduce safety concerns tremendously. Combine all this with access to information available on the Internet, and safety issues can be quickly brought into focus and managed. Knowing "who is qualified to do what and when" is the best rule of thumb. Conversely, knowing "who should not do what and when" is crucial. 7. "We don’t know how to fix problems when they occur. We’re not familiar with some of this stuff." This complaint, like avoiding things more "technical," is quickly fading. With the focus on specialized work environments and independent contractors skilled in a small segment of the total job, the do-it-yourselfer and jack-of-all-trades who might file this complaint is becoming rarer. Likewise, simplification of equipment and systems are making for many fewer headaches and frustrations. It’s also important to remember that newer equipment is better understood by operators, that the use of pictures and graphics in literature communicates more effectively, and that the Internet can greatly improve the "familiarity factor." Of course, use breeds familiarity, but the real proof is success. More and more contract operations at all levels of the insulation trade are benefiting from the advancements being made in products and their features. 8. "We never have the things we need! Availability at the job site is a problem." Supply and demand drive our economy. With the growth and maturity of distribution in the insulation industry, in-stock product (even for specialty fastening items) has vastly improved in the last 10 years. Likewise, the understanding of what is needed (especially in local markets and according to regional use patterns) is much better between vendors and manufacturers. This "right product for the right application" scenario has driven manufacturers to be more keenly aware of product availability. Many suppliers have in place "just-in-time" or "on-site" consignment inventories to assist the user precisely when the need arises. 9. "We’re not that familiar with pin/stud welding and it’s too hard to get the information." There will always be those companies that are reluctant to change, and others that don’t take advantage when labor-saving techniques enter the picture. But for the most part, the construction market is comprised of companies that advance their productivity by adopting improvements in their use of time and labor. In today’s labor-cost market, labor-saving systems are the name of the game, like pin/stud welding systems for commercial and industrial insulation fastening. The really bright spot is that newer pin/stud welding equipment is much easier to use today. Equipment manufacturers are marketing the lightest weight, most fully capable equipment ever produced for pin fastening applications. The most advanced models even feature built-in diagnostics and other electronics to assure shop, supervisory and field personnel optimum working conditions before, during and after use. Moreover, manufacturers, representatives and distributors are offering more hands-on training, as well as equipment support, right from local branches. Factory-trained technicians are more prevalent too, specializing in 800-line product support and assistance. Finally, don’t forget the impact of the Internet! Certain websites feature the how-tos on use and setups, all at the touch of a button, all making sure that being familiar is well within the reach of every user. 10. "There really isn’t anything new. Nothing’s really changed." Change is a way of life in today’s mechanical fastening market! While it can be true that the basic product and processes haven’t changed that much, the methods of delivery have changed forever. Long gone are special power requirements for welding fasteners, even those approaching 1/2-inch in diameter. Nor is equipment so heavy that it takes an extra crew and scaffolding to support it. In fact, today a 30-pound or less pin welder is the standard for most innovative contractors. These new lightweight units include self-diagnostic components as standard features to make preparation and use a breeze. System support from distributors and manufacturers is at an unprecedented level, with access to a multitude of Web-based materials available on the computer from any location. All in all things have changed, not only a lot, but also for the better! An installer fastens insulation with cup head weld pins.